Figure Prints is very important things for any immigration. In the earlier of 2018, only left hand’s thumb impression was required to pass the fingerprint test. But from the May 2018, the Malay immigration authority takes the 10 figures impression! This process is 10x harder than old figure print process. But some days ago they took only 2fingures. How to Apply for a Malaysia Visa? Go to a registrant visa agency and apply via them. It is very easy. But don’t give your money to a fake agent. Just check and find out a register visa agency near you and give your passport them to apply. There are some important matters you should clear with your agent. Such as How much Salary, How many hours overtime per day and OT payments etc. Beforehand over the passport copy; take a color photocopy first and safely save the photocopy papers. It is important too! Remember that- If you get a work permit type visa; you should be done the Malaysia Visa Check process in online. For the student visa- you can be done it by passport number only. How much time takes to process a visa? Generally a worker visa like calling visa or professional visa take minimum 15 days to maximum 2 months 15 days. Within this time, I hope you will get your work permit sticker. Student visa takes as like the working visa also! But tourist visa process time has no minimum or maximum time security. Recently, We collect some sensitive information about Malaysia Visa. Some visa agent can give you visa within 7 to 10 days only! Book your plane ticket and make sure your flight. You can go to the Malaysia airport on a direct flight. But clearly, talk to your ticket provider about the flight route and airline. Because some airline’s flights take an intermission in Singapore. Talk your ticket broker about this, before booking a flight ticket. You should be careful from the Malaysian Airlines. Because this Malaysian Airlines hijacked also! So save yourself from the evil occurrence. Recently, the South Asain countries such as Bangladesh, India, Pakistan & other countries peoples are like to process and get a Malaysia Calling visa. Though some peoples are like the Malaysia Professional Visa still now! Here is the link (JABATAN IMIGRESEN MALAYSIA) to check the calling visas. 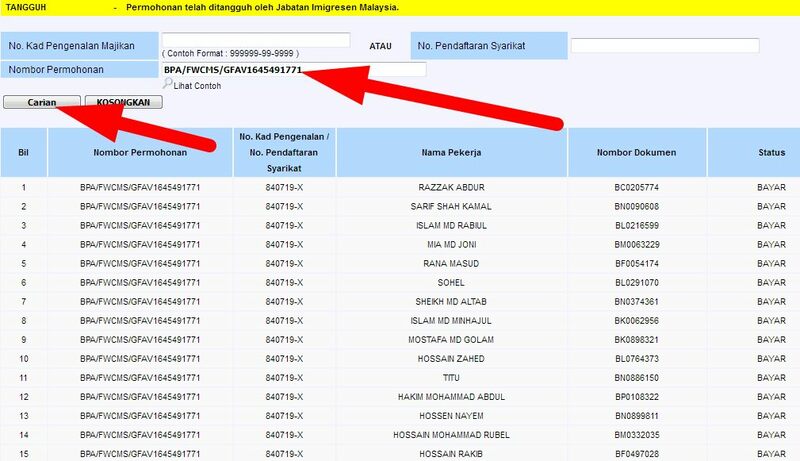 The Official Portal of Immigration Department of The Government of Malaysia (Jabatan Imigresen Malaysia) has been creat the web-based online Malaysia Visa Check Software for every worker! The Immigration authority always tries to help you to easily check Malaysia visa in online. You don’t need to go to any other office or embassy for Malasia Immigration Check Visa Status. Just use the online method of myimms e services of 2018. E.G: It is the way to Malaysia Visa status Checking without passport number. See the Image above. It is a successful calling visa check information’s screenshot! So Analise the image deeply. Firstly Type the Visa Application Number (Nombor Permohanan- find form the visa sticker or visa copy) box and then Click submit (Carian). Within few seconds you can see your visa fake or original. Calling is one kind of group visa. In a calling visa page, there are minimum 15 to 25 visa is attached. Check a Malaysia professional visa by your passport number and the visa application number. Ask you visa agency to get the visa application number. And then go this link (my IMMs e-Services). Now type your visa application number on the Nombor Permohanan input box, Type your Passport/Travel Documen Nomber and select your nationality/country such as Bangladesh, Pakistan, India or others. Finally, click the Carian/Submit to get professional visa information. NoteBook: Please be careful if you are a Bangladesh Malay worker. Because from 2009 to 2017, there are a lot of Bangladesh visa cuts by Malaysia. Click on the link of Status Permohonan and print your Malaysia Visa Status online’s copy! Isn’t easy? I think this process is one of the worlds most easy work. So go ahead with a good confidence and believing in Allah to get success. Another world’s most easy work! Just go to this link (Here) and type your passport number and select your country from the drop-down menu. Then click submit and see your student visa fake or original! It needs the 10second cost to check a Malaysia Student Visa check! This visa check system is not available online yet! But our team members are searching the Malaysia Tourist Visa Check link madly. Don’t worry, if we inform about the online checking process; we will inform you as soon as possible. So stay with us. We recommended- Please Check your every kind of Malaysia Visa. We think You have already learned the Malaysia Visa Check Status online process. Please share this super article with your friends and family member. Finally, we want to say- give us your advice, complaint or any other opinion via the comment box. Excellent. Thank you and good luck. please tourist visa checking perfect number,,,BQ0603120….??? kindly cheak my visa online……?